This one is – advanced – do the others first! 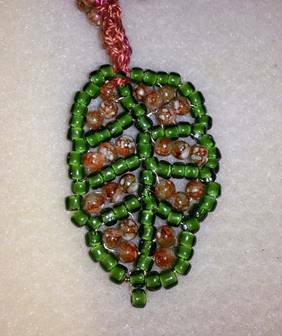 If you have done any bead weaving before, you will recognize the principles, but these tutorials will help you move from circles and straight lines to the next level, creating basically anything you like once you get the hang of it. They can be done on Fireline or similar bead weaving thread, but I like 28g or 30g wire for its ability to mold and hold a shape. Pieces made with thread can be a bit floppy. Then again, for some projects, that may be best. Use your judgment. This set is for me, and I wear it a lot. It is based on the "Soap Bubbles" pattern in The Beaded Edge by Midori Nishida, from Interweave Press. There are two videos on YouTube that demonstrate variations, here and here. They are in Japanese, but that doesn't matter, since the quality of video instruction is top notch - no words necessary. This one was made for a Japanese friend. How did I guess she would like black and red? 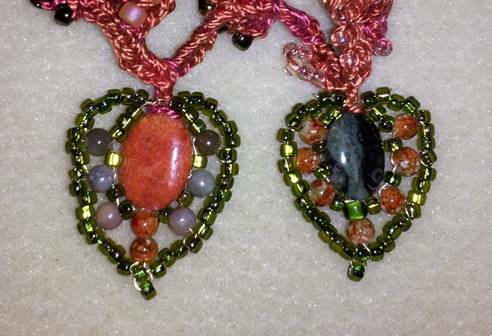 The central pendant has a large "carved Cinnabar" resin bead surrounded by coral rounds, all wired with 28g black wire, then crocheted in with the same black size 3 yarn as the rest of the necklace. The other beads are irregular glass ones in a matching color. I love their irregular shapes and the fact that their holes are very large, which is convenient for sliding onto the yarn. The necklace is long enough to fit over her head, but I did make a similar one with a central pendant that doubles as the toggle. This one is for my mother. It should go with lots of things in her closet. It was a total experiment, and loads of fun to come up with these strange new elements. The next one will be beach-themed, with rich colors, for a friend who likes those. After the success of the above, I went hog wild, making a this piece for my friend Hollie. It’s called “A Walk in the Woods”, which explains its inspiration. When walking in the woods, I tend to marvel at small things, and usually come out with a little collection of interesting objects. Hollie loves the woods, and I suspect she does the same thing. This one took a lot longer and it was much harder to determine when it was finished. There were so many colors to incorporate, and mixing them all required layer upon layer of crochet in order to balance them. Also the central pendant took three tries just to work out the logistics. 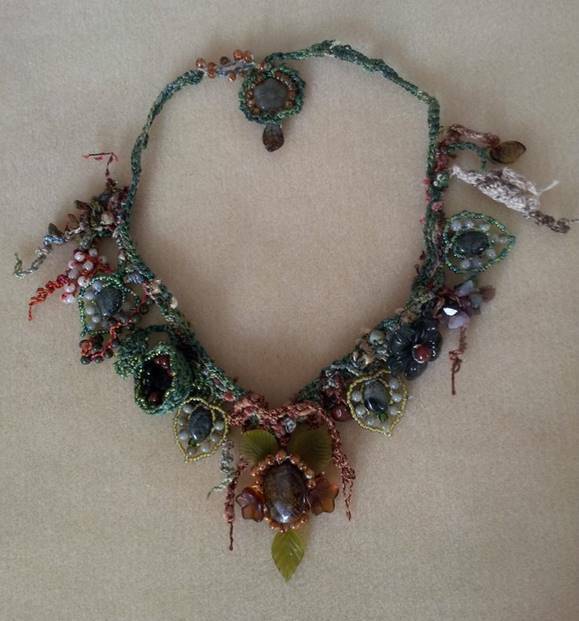 It required both crochet and wire to make the elements lie the way I wanted them to. Then came a crocheted garden for a friend who loves color. I finally developed a tutorial for this type of piece, (click here for a DOC and here for a PDF) and the ones above and below. Basically, once one learns the technique, the piece itself is limitless - any colors and shapes you wish can be produced. 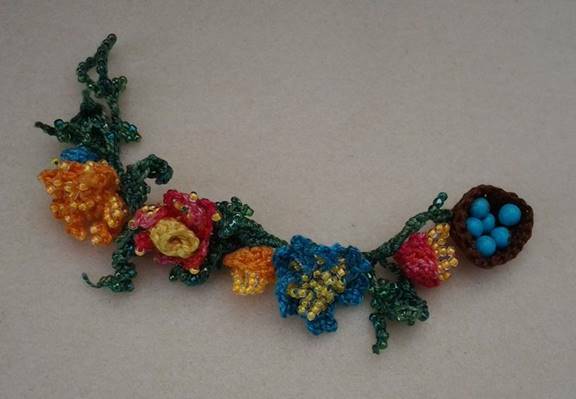 The flowers are based on a technique taught in The Beaded Edge by Midori Nishida, which I highly recommend, as well as her The Beaded Edge 2. 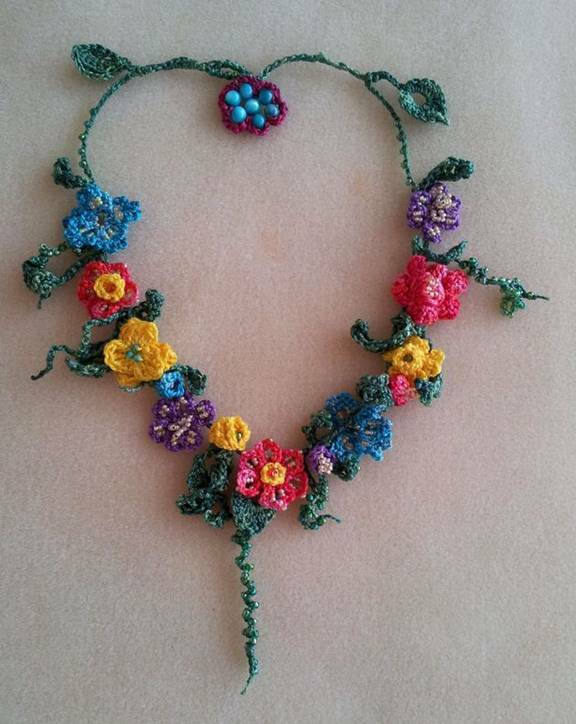 I wired the toggle and crocheted around it in the same way as those on the two necklaces above. 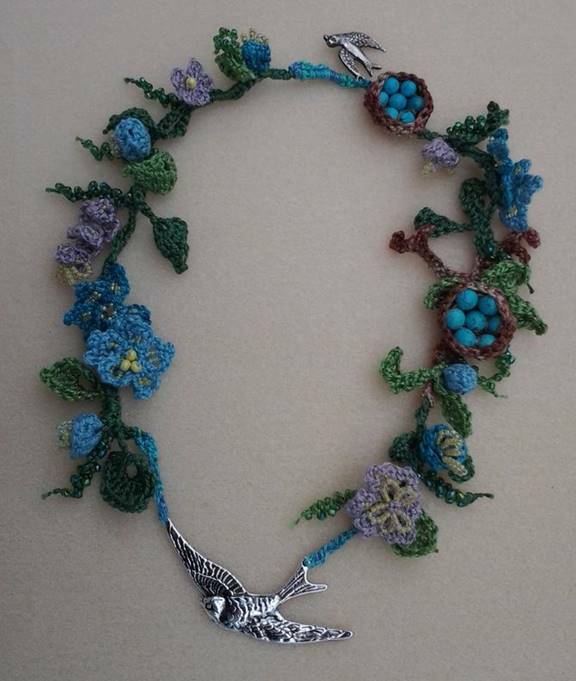 All of these necklaces are put together using a freeform crochet technique of simply choosing yarns and hooks and playing until the shapes are pleasing, then putting them all together with a long strand, using single crochet and slip stitches, from one end of the piece to the other. Then for strength, I go back the other direction for a second layer of stitches. This also helps control the stretching a bit, as all crochet will stretch. 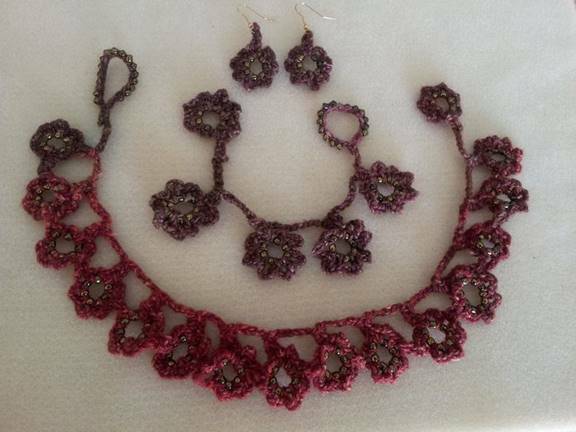 All three necklaces were made mostly with DMC #5 pearl cotton, but "A Walk in the Woods" has some other novelty yarns as well. Altogether, it has about eight different yarns in it, all stitched with a #2 aluminum hook, as are all these pieces. Meanwhile, I've designed a very detailed, very exciting undersea-themed one that will have some stuffed elements in it. Can't wait to get started! For more information on freeform crochet, look back here in the next couple of months. Also see the International Freeform Crochet Group, and type "freeform crochet" and/or "scrumbling" in any search engine, then click the images tab. This is guaranteed to keep you occupied for hours. Prepare to have your mind blown! Freeform Style by Jonelle Raffino & Prudence Mapstone, and for that matter, anything else by Prudence Mapstone, whose work is truly amazing. I also like Edie Eckman's books. She uses great color combinations and has a whole book dedicated to edging, called Around the Border Crochet. 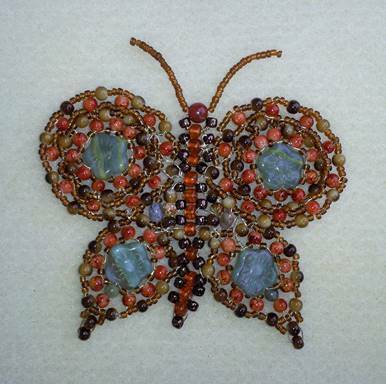 Many of these designs can be adapted for jewelry by using a small thread and hook. Embroidery tool fobs I made. These could be made with cheaper materials, but I am only making one set, and they should be as nice as possible. Working with lovely tools makes the creative experience richer, and provides inspiration as well. All my fobs are made with semiprecious stones, glass, and silver or gold plated metal. The tools are the best quality as well, which means they will last and be a joy to work with, not necessarily that they will cost an arm and a leg. What's the point of creating pretty fobs for crummy tools? The two fobs on the left can be used for any tool, and are also long enough to serve as bracelets on their own. (I actually wear them that way fairly often.) They would clasp to the tool on one end, and be strung onto the chatelaine ring at the other. The three at right are clasped to a single yoke. Two are Loran needle threaders in the two popular sizes -- I cut a two ended threader in half and trimmed each end with scissors until it would fit into the end of the silver bead, then anchored it with a little Sculpey and baked it for a very few minutes in a toaster oven. After that, I devised a way to anchor the end of a length of beading wire into the other end of the bead (using two crimp beads, strung so they could be pushed into the large bead one at a time, but when pulled, would form a V and both try to come out at once, thus they would not fit). 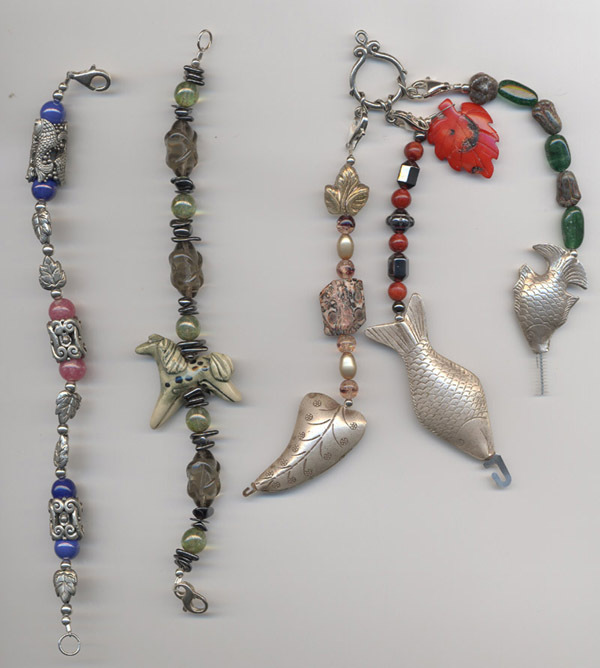 The larger one (middle) is strung so that when it is not attached to the yoke, the clasp hangs down inconspicuously, and the red coral leaf forms the end of the fob. The third (far right) is a Butler brush anchored inside with two crimp beads (couldn't use Sculpey because the brush would have melted in the oven). The large beads are Thai silver, which is not too shiny and has a soft, warm feel in the fingers. They are also hollow and rounded, which makes them easy to grip and to use repeatedly without strain. If you decide to make fobs for your tools, always start with tools that work well and are comfortable to use, then be sure the fob will not get in your way or press uncomfortably into your fingers or hand. Remember you will be *using* these, not just looking at them! Embroidery tools needing fobs. 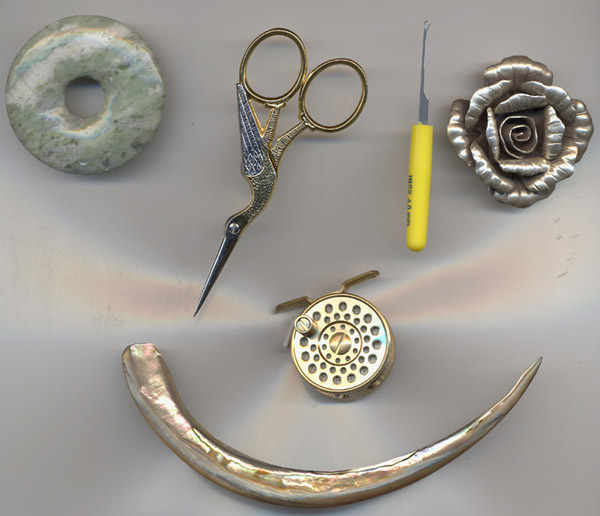 The seam presser (or donut, if you get one at a bead shop), stork scissors (by Klaas), small latch hook, and abalone stiletto came from Lacis. I also have a bone one with a hole at the top (not shown). The abalone stiletto would need a sheath which would attach to the yoke, since the shell may be too delicate to drill and wire. The same will happen with the scissors (rather than attaching the fob to the handle, which would interfere with using them). There is also a seam ripper (not shown) that would need a sheath because it is flat and sharp. I am thinking of making the sheaths of suede or leather and embroidering them. I intend to set the latch hook into a long, smooth bead, maybe a glass one, and get rid of the plastic handle. Failing that, the handle and clear cover (not shown) might be covered with polymer clay. The silver rose is destined to be the top of the chatelaine, to which a large ring will be attached -- all the tools will hang from this ring. The fishing reel style measuring tape came from Restoration Hardware, and I picked it up because that was the kind of tape used in the past, before there were automatically retractable ones. The metal tabs at the sides allow it to sit upright and stable on a flat surface, and there is a hole in the tab opposite the pull, to which a fob can be attached. The end of the tape is plastic, but I'll replace that with something more attractive, and will also cover the round, flat sides so the tool looks less like fishing tackle and more like something a refined needle-worker would have hanging from her waist. These tools will complement others you have bought that need no embellishment, like pewter needle cases and pincushions, for example, of which some truly beautiful specimens can be had -- and *used*! In this way, an embroiderer can amass a gorgeous collection that would be the envy of any lady of past times. The fob in progress for the measuring tape above. The white glass beads were handmade in Murano, Italy, and given to me by a good friend, making this piece extra special. The plain white plastic tab has been replaced with a beaded pull, double-wired for stability, as the pull will be subjected to more stress than most fobs would. (The tape itself is sturdy fiberglass.) The fob will be attached to the hole at the other end of the tool (the odd looking metal object at left holds the beads on the wire until they can be secured -- a terrific item for beaders -- I wouldn't be without two, one for each end of any work in progress). A free-form rose pattern will be beaded onto two circular pieces of material, which will then be glued to the sides, finishing the tool. A picture will be posted as soon as the piece is completed. 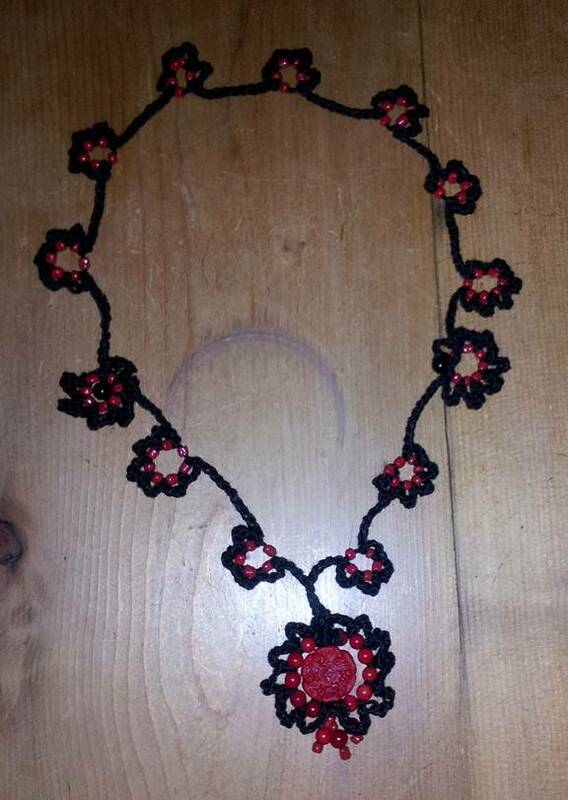 A necklace I made for my Mom from beads I had bought for their beauty and had done nothing with. 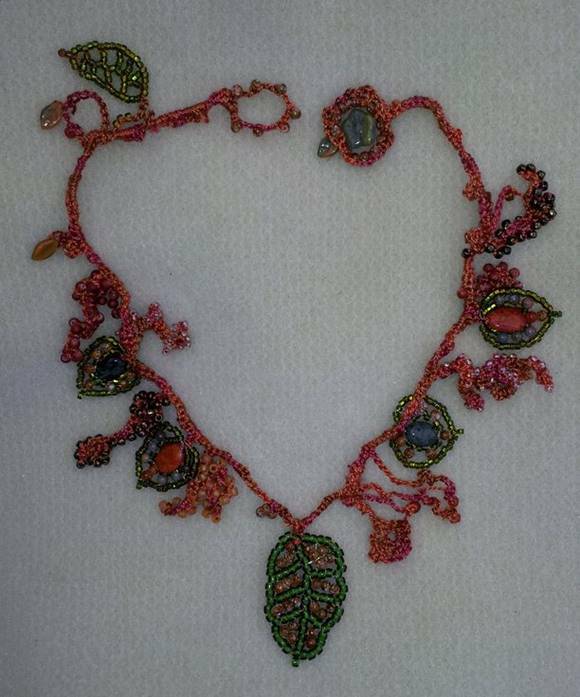 Made with semiprecious stones, glass (only the smallest seed beads), and silver. Strung on silver-colored beading wire. This is called a Bead Soup necklace. Here is a tutorial for making your own. Click here for a DOC and here for a PDF. 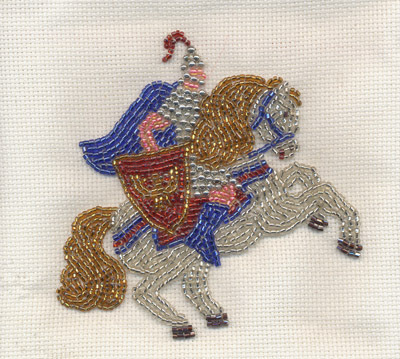 My beaded knight, made years ago and intended as one side of a small purse. He is about 4" (10 cm) high and wide. Any suggestions as to what to do with him? Maybe to make him a box top and bead the background part way up from the bottom in greens for grass, and the rest up to the top with blues for sky? A good friend has suggested simply painting the background, and I think that's the best idea, but I still don't know what to make him into. I am in the process of planning a simple stitch sampler, then will practice some animals, flowers, and insects as small box covers before moving on to my stumpwork chest. The latter has already been constructed of wood by my very handy father (Thanks Dad!) and will be used for my tools and materials. Now all I have to do is cover it! I will post my projects here as they come together. The next embroidery project is a pair of beaded felt eyeglass cases with Art-Nouveau style images. One, already planned, will be poppies and several kinds of insects. The other, still nebulous, will be a lotus flower, frogs, and other aquatic creatures, including more insects that you would find near the water. Can you tell I like bugs? They're such a fun subject, and they were often featured in Art Nouveau designs. My dream project is a stumpwork tapestry, maybe 4' tall and 3' across, in a Medieval style similar to the pictures in illuminated manuscripts. At the top will be a walled town with a castle, and people all gathered outside the gate. Farther down, a pleasure garden with a courting couple, a potager with gardeners, a field with shepherd, sheep and wildflowers, and a forest with hunters, dogs, and wild animals. It will be framed with thick, stuffed embroidery, with flowers and leaves and animals entwined. The idea is that the more you look, the more you will see. Yes, it's ambitious, but I'll get to it someday.